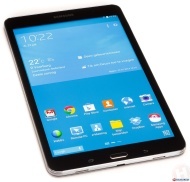 alaTest has collected and analyzed 3567 reviews of Samsung Galaxy Tab Pro 8.4 (T320, T325). The average rating for this product is 4.5/5, compared to an average rating of 4.5/5 for other products in the same category for all reviews. People are impressed by the price and size. The screen and usability are also appreciated. We analyzed user and expert ratings, product age and more factors. Compared to other products in the same category the Samsung Galaxy Tab Pro 8.4 (T320, T325) is awarded an overall alaScore™ of 91/100 = Excellent quality. The Samsung Galaxy Tab Pro 8.4 is a fine example of the increasingly rare premium Android tablet, but it's not the best small-screen value. Thin and light. Sharp display. Fast performance. Runs Android 4.4 KitKat. Expensive. Needs better palm rejection. The Samsung Galaxy Tab Pro 8.4 packs a sharp pixel-dense screen, zippy performance, and oodles of software features inside a comfortable and lightweight slate. The $399.99 starting price is expensive. It's too easy to block the speakers and trigger the capacitive buttons unintentionally when holding the tablet in landscape orientation. Performance lags when using the multiwindow function. When it comes to tablets, 8-inch is the new 7-inch, and Samsung's Galaxy Tab Pro 8.4 rocks the runway with a high-end user experience to match its high-end price tag. The ; packs a sharp pixel-dense screen, zippy performance, and oodles of software features inside a comfortable and lightweight slate. have all made their marks, customers finally have some solid choices on that front. But I'm not sure if any of them have hit quite as sweet a balance as the Galaxy Tab Pro 8.4. In many ways, I've found my ideal tablet. Is Samsung's Galaxy TabPRO 8.4 the Android tablet to beat? Read our full Galaxy Tab Pro 8.4 review to see our thoughts on Samsung newest tablet addition!